Step on board the Royal Crown and enter the elegant romantic world of Europe in the 1930s ~ a time of economic depression during which musicians and actors provided a fantasy world of glamour and carefree amusement. The rich and famous traveled through Europe in style, enjoying elaborate meals, decadent company, and fine wines. Legendary ships and trains reigned supreme and marked a golden age of travel. The Royal Crown is a celebration of the style of that era. Everything on board the iconic Royal Crown suffuses style and decadent glory: Art Nouveau lamps shine a subdued light on polished bronze, glass mosaics and mahogany wood. Attractive veneers express the exquisite, exotic Art Deco sundeck. Soft upholstered armchairs invite you to nostalgic meals on opulently set tables. All the while, the stirring sounds of Gershwin, Duke Ellington or Marlene Dietrich add romance, adventure, and allure to this unparalleled ambiance. Your stay on the Royal Crown will be a travel experience in itself. 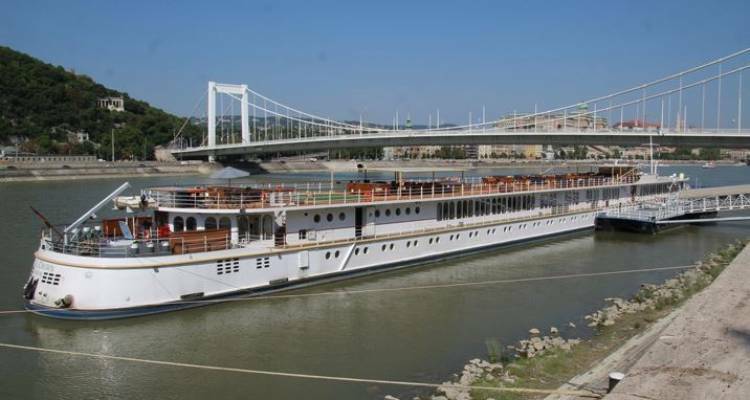 This legendary ship offers you everything to discover the Romantic Heart of Europe. Enjoy the extraordinary devotion of the warm and caring staff on this illustrious ship celebrated for its matchless reputation. Once you stay on board, you’ll understand! We invite you to immerse yourself in a one-of-a-kind experience and take pleasure in an unparalleled array of onboard amenities. The Royal Suite has a king bed and it cannot be separated. One of the benefits is the Royal Suite has a desk ad a TV that can be used as a 2nd monitor. One of the drawbacks is the TV does not face the bed, but the sitting area..
You can actually turn the TV around with a little work to make that happen. It is located on the main level- same as the Lounge, Dining Room and ship entry and exit. If you have mobility issues you should definitely think about this Category Upgrade. Each cabin (Deluxe, Premium, Royal Suite) provides the ultimate private sanctuary on the river. Like any 5-star hotel, each spacious stateroom provides a comfortable retreat with the finest linens to sink into after a full day of exploring. Each has a fully equipped bathroom with a shower, bath & body products, magnifying mirror, hairdryer, plush bathrobes and spacious built-in closets. Furthermore, a safe deposit box, individual thermostat for air conditioning and heating, flat-screen TV with satellite and minibar are at your disposal. Dining on the Royal Crown is a true pleasure. Seated at private tables with crisp white linen, candles, embossed silver and fine porcelain, you will dine in royal fashion. The cuisine of the Royal Crown is superb. Freshly prepared dishes made with local ingredients are graciously served along with recommendations of meticulously selected wines. Whilst you enjoy the relaxed conversation and watch the landscape tranquility pass you by, courses seamlessly follow one another. Also, the breakfasts and lunches on the Royal Crown are à la carte, and of a truly royal allure. You can enjoy Afternoon Tea just like royalty and late night snacks are available too. Bon appétit!